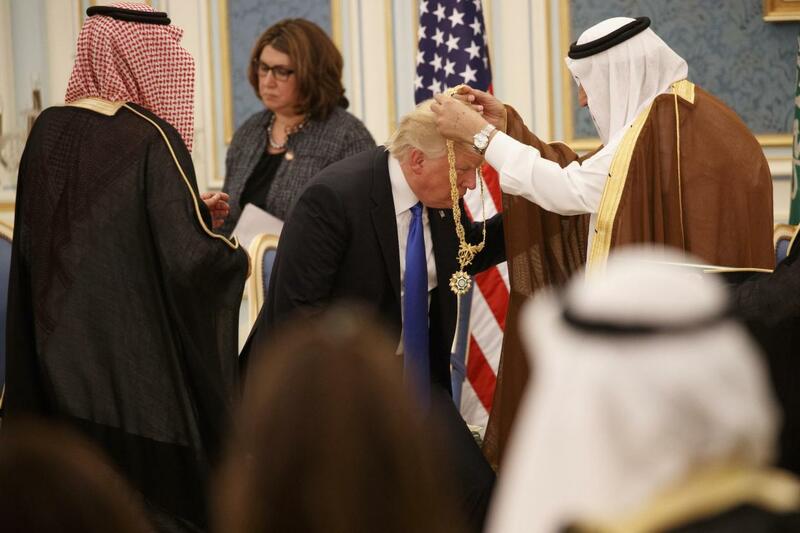 Donald Trump received Saudi Arabia’s highest civilian honour within hours of touching down in the Middle Eastern kingdom. King Salman placed the King Abdulaziz al Saud Collar around Mr Trump’s neck during a ceremony in the country's capital, Riyadh - the first stop on the US President's nine-day, five-country tour. The gold medallion has also been bestowed on Russian President Vladimir Putin, British Prime Minister Theresa May and Mr Trump’s predecessor, Barack Obama. While in Saudi Arabia, the US leader is expected to give a speech on Islam. He also announced a $110bn arms deal between the two countries. Members of the White House delegation in attendance included First Lady Melania Trump, Mr Trump’s eldest daughter Ivanka Trump, Secretary of State Rex Tillerson, White House Chief of Staff Reince Priebus, senior adviser and son-in-law Jared Kushner and Chief Strategist Steve Bannon..
On Mr Trump’s first trip abroad as president, he will also visit Israel, the Vatican, Italy and Belgium.